We LOVE pipe cleaners! They are one of my favorite kid crafty supplies. There are so many things you can craft with them, and they come in all sorts of fun and fuzzy colors. 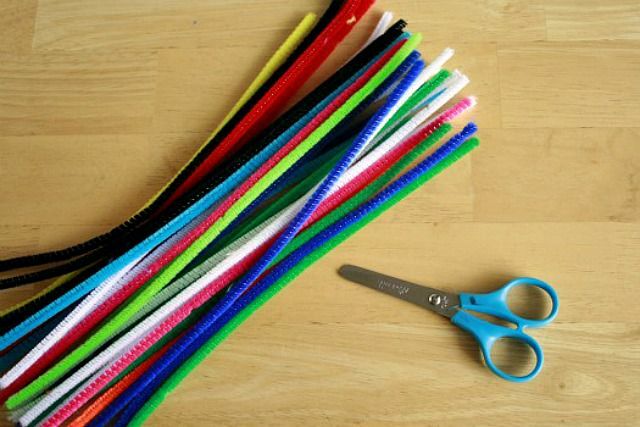 These craft supplies are referred to as pipe cleaners, chenille stems, or fuzzy sticks. Whatever you call them, there are tons of fun crafts to make with them! They are the perfect size and shape for little hands, from ages 1 to 100! Really, there's no limit on what can be created. Keep them plain and twist them around or add on beads or yarn to give them a new look. Here are 10 simple craft ideas to make with pipe cleaners! Letter Shapes: Use pipe cleaners to form letters, helping little ones make letter shapes, talk about the sound of letters, and putting letters together to form words. Pipe Cleaner Paper Clips: These are perfect for attaching all kinds of paper. I bet there’s a teacher or two who would love a set of these! Caterpillar Pets: These cute little caterpillars are currently climbing and inching their way all around our house. With just pipe cleaners and beads, make your own simple and perfect little crafty pet. Jingle Bell Shaker: These simple bell crafts are perfect for kids to help make and jingle, adding some extra cheer they dance and sing to music! Rainbow Pasta Bracelets: We’re colororing pasta and making necklaces with yarn, using pipe cleaners and following the rainbow pattern as we bead our pasta. Chicka Chicka Boom Boom Story: Create a Chicka Chicka Boom Boom Alphabet Bin with a pipe cleaner coconut tree. This craft is simple, inexpensive, and easy enough for a 4-6 year old child to do with minimal help. Heart Shaped Goggles: Are you looking for LOVE? Well, these *love* goggles are here to help. And so are pipe cleaners. They are just begging to be bent into a heart shape. Pipe Cleaner Sparklers: Create these fuzzy sparklers with a few pipe cleaners! Find the sparkly looking pipe cleaners in your crafts store to give these some extra bling. Pretty Pipe Cleaner Bouquet: I’ve put my own little twist on a pipe cleaner flower for a Mother’s Day Bouquet. You can bind them together all on their own or place them in a flower pot. Dinosaur Pipe Cleaner Creature: This is a great make-anytime activity that you can do with minimal preparation. Pull this one out next time your kid says she’s bored, or on a rainy day. Have fun crafting with pipe cleaners!